Your organization does its work as projects — unique or first-of-a-kind activities that your organization has never done before. Projects, as distinguished from operations, present special problems. This book is for people confront issues that have never been seen before by anyone in the organization. And it's written for busy people who don't even have time to read the directions on their prescriptions. Is "leading" your organization a white-knuckle ride? As a leader of a project-oriented organization you probably often feel like you're riding a hurricane. Juggling multiple projects, all competing for resources, many of them late or over budget or floundering, while at the same time you "manage" your organization, you sometimes wonder if there's a better way. There is. Your organization does its work as projects — unique or first-of-a-kind activities that your organization has never done before. Projects, as distinguished from operations, present special problems. 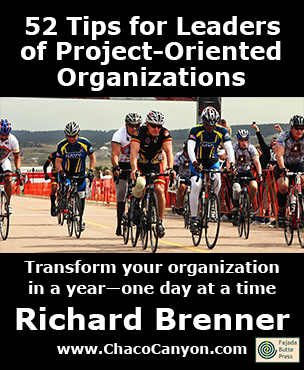 That's why I wrote 52 Tips for Leaders of Project-Oriented Organizations . It's for people who don't even have time to read the directions on their prescriptions. As a leader of a project-oriented organization, you face an unprecedented degree of uncertainty. Today's dynamic conditions and competitive environment are conspiring to make executing even the most conservative project plan a thrill ride, but that's only a small part of the problem — all managers face that one. Today's organizations have inherited much of their structure from "operations-oriented" organizations. They don't work very well when they have to work in projects. Learn how to design, adjust, and lead an organization that does its work — for the most part — in projects. You'll get as much from this little tip book as you'll get from one of those two-pound books you don't have time to read. And once you start deploying some of the ideas you'll be reading about, you'll free up some time to think. Accounting systems are fairly good at measuring concrete items, such as cash, revenue, outlays and so on. But many cost drivers in the project-oriented organization are difficult to measure, and they're often unrepresented in the accounting system. For instance, when we choose cubicles over walled offices, the cost savings are well represented in the Facilities budget. But the increased costs due to interruptions and depressed productivity of the cubicle occupants appear nowhere. When we rely on the accounting system to make decisions, we probably do well in the short term. But the long-term effects of the failure of the accounting system to model all costs often depress organizational performance. Make decisions based not on the projections of accounting-based systems, but on more realistic models of organization performance. When managing dispersed teams, we sometimes refer to the sites where team members work by names such as "HQ," "Corporate," "home office," "plant," "fab," "lab," "remote site" and "field office." These names can be toxic because they contain organizational status information. When site names denote organizational status or role, they affect the self-image of the people who work there. The effect can be so strong that it can actually influence career decisions. In team decision-making, people who work at high-status sites can have undue influence. To help manage these effects, choose site names that are either arbitrary or geographical. For instance, name your sites after mountains or rivers, or national parks. Or refer to sites by local geographical features, such as a city or street. Status-neutral site names help members of dispersed teams see each other as peers, which leads to better decisions. Know when to let someone else "sit in"
52 Tips for Leaders of Project-Oriented Organizations is in Acrobat format, which gives you several advantages. You can print it, and read it like any book. Or in electronic form, you can use the search capability of Adobe Reader to find passages of special interest to you. If you load it onto your laptop, tablet, or other mobile device, you can read it anywhere — and it's weightless, too. 19 pages.